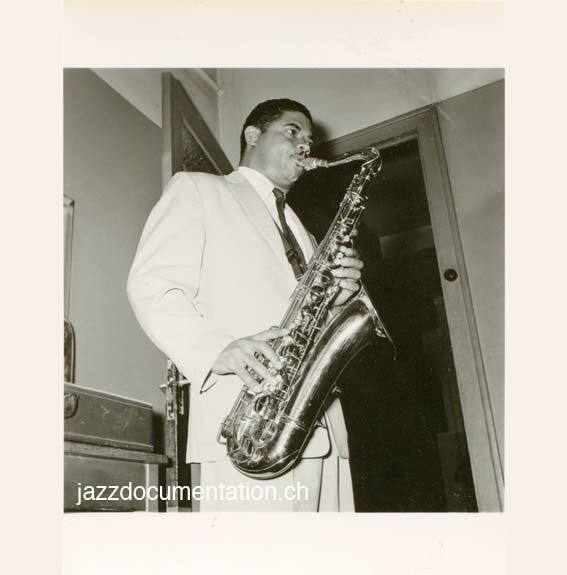 A copy of the Freddie Green photo is also in Hans Phillipi’s notebooks now residing in the collection of Mario Schneeberger. 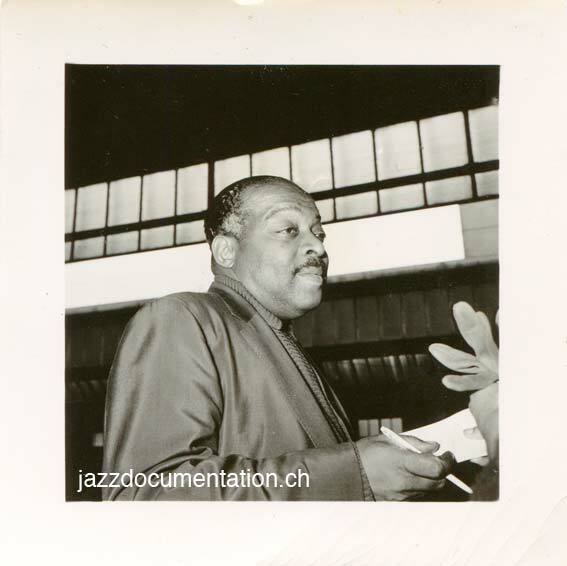 That copy (edited) was used in the booklet of TCB CD02202 Count Basie Orchestra Mustermesse Basel 1956 Part 2. And finally another photo from the train station. There are several people here whom I could identify thanks to Peter Vacher and Bill Lee. 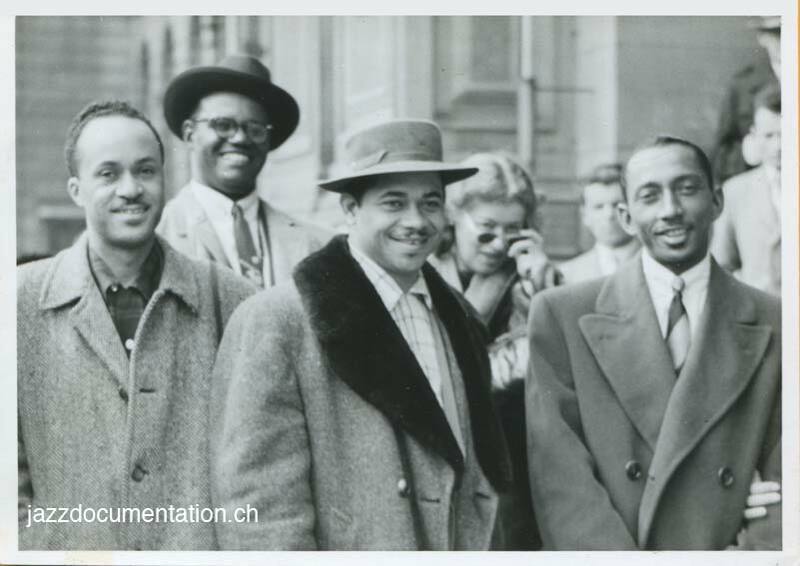 This entry was posted on November 20, 2011 at 5:36 pm and is filed under Count Basie, Photographs with tags 1956, Charlie Fowlkes, Count Basie, Ernie Wilkins, Frank Foster, Frank Wess, Freddie Green, Geneva, jazz, Joe Newman, Marshall Royal, switzerland, Victoria Hall, Wendell Culley. You can follow any responses to this entry through the RSS 2.0 feed. You can leave a response, or trackback from your own site. This is a great post! I might have info on the band members as I have record of who went to Geneva. Will send to you, and hope this might help. 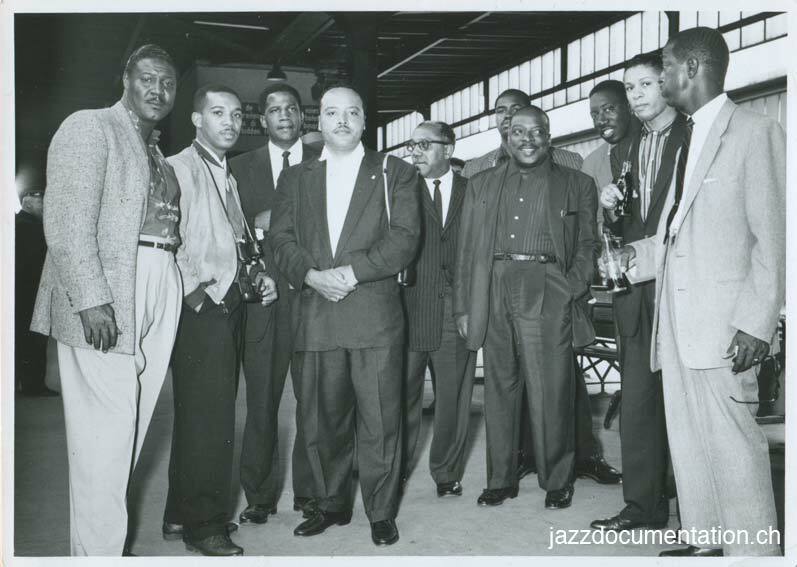 The unidentified musicians are: left to right, Benny Powell (tb); Bill Hughes (tb); Bill Graham (as); Wendell Culley (t) at Graham’s right, and Eddie Jones (b) just behind Basie. Charlie Fowlkes isn’t in the picture! I will correct this now. I did not recognize Culley with glasses on and I made the wrong conclusion that glasses= Fowlkes. Would you have an idea who the man in the middle on picture No.5 might be? P.S. : The photo of Powell that I have send you is also from this dressing room series. When you received that, did you also get the other photos that I send you? Thanks for posting these, it is great to see again so many musicians who brought so much pleasure to those of us who heard and saw them. 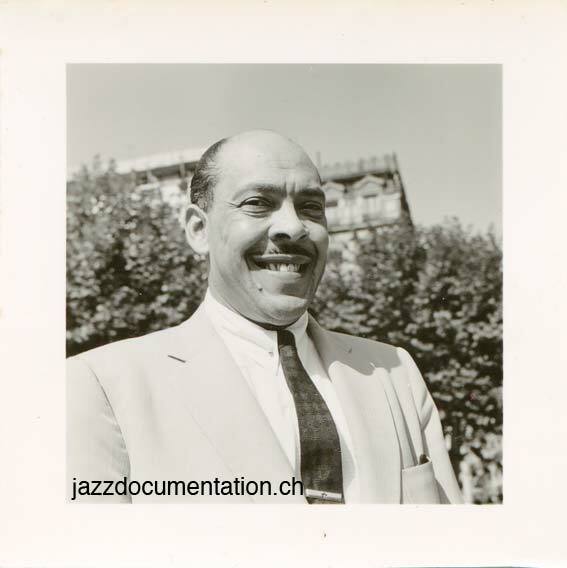 Can I suggest that the unidentified musician in picture 5 is Frank Wess (see also p.4). His stature and general appearance is right (and the moustache is a giveaway!). 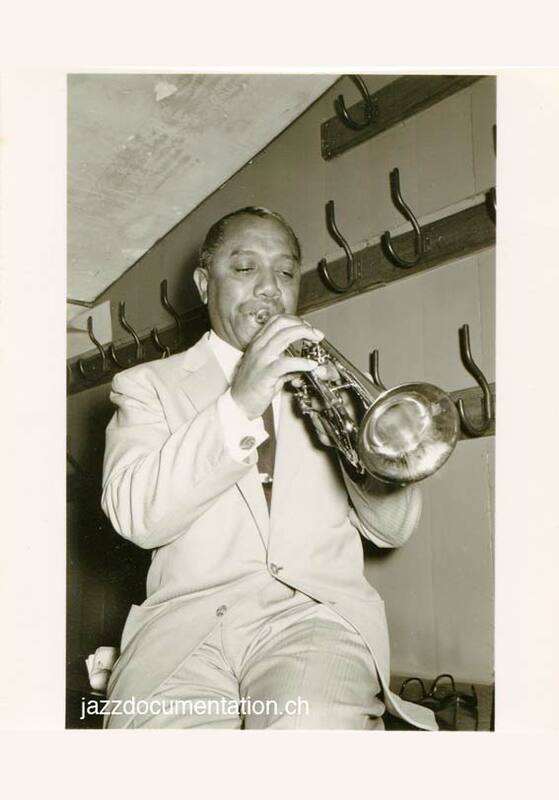 You are right, of course this is Frank Wess – and i have added his name. 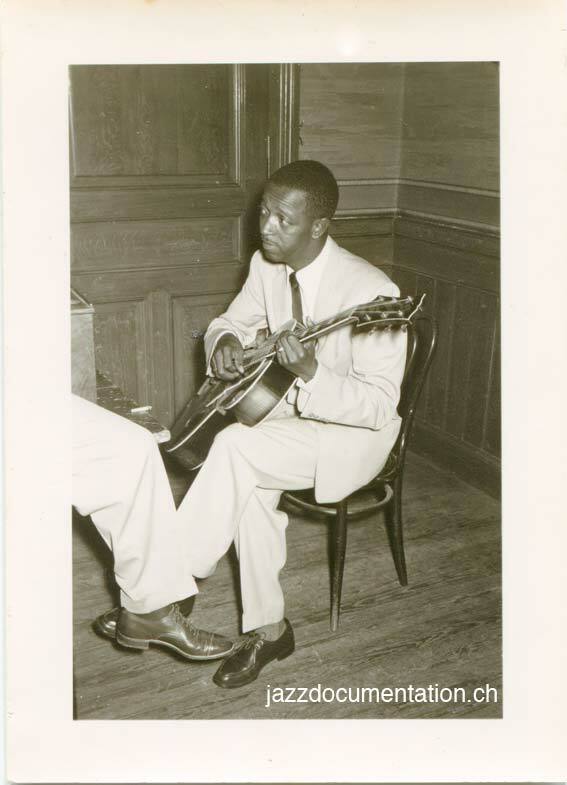 Photo seven..Benny Powell (???). That’s Freddy Green on the left side in the photo. Fantastic job. 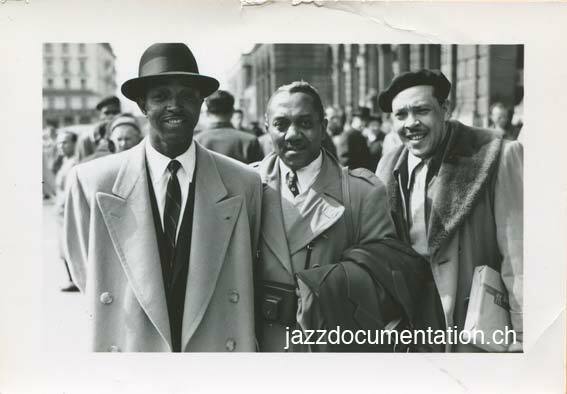 One thing, though: “Benny Powell (??? )” is Freddie Green.